You are here: Home > News > Launch of Bake A Building 2018. 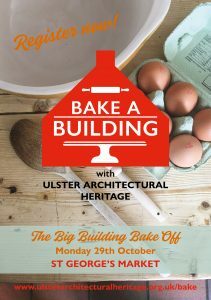 Ulster Architectural Heritage is pleased to announce ‘Bake a Building’! A baking challenge like no other, we are calling on– professionals, amateurs, kids, school groups and organisations- to choose your favourite historic building, and BAKE! The project aims to use the popular medium of baking to encourage people, of all ages, to take a closer look at our architectural heritage. The winning entries will demonstrate excellence in detail and taste. To enter, participants are simply required to select their favourite historic building and BAKE! UAH will provide each participant with a Bake a Building Starter Pack. Judging by celebrity chefs: BBC’s Paula McIntyre, Jane Allen, Jane’s Kitchen & Finbar Haughey, Andrew Ingredients. Prizes from Food NI, Merchant Hotel, James Street South, Andrew Ingredients, Ditty’s Bakery, National Trust, Waterstones, Craftsy and Ulster Architectural Heritage. Entries will be judged at ‘The Big Building Bake Off’, St. George’s Market Belfast on 29th October. Everyone is invited to see the bakes at this special celebratory event, and join us for the tea party! To enter, competitors must choose a building from the list below, and register with Ulster Architectural Heritage by 5pm on 12th October 2018. Judging will take place on 29th October 2018 at St. George’s Market, Belfast, from 12pm. There will be stalls and entertainment for all the family. More information on this special day coming soon! In partnership with Food NI, funded by Belfast City Council. To enter the Big Building Bake Off participants are required to register here.